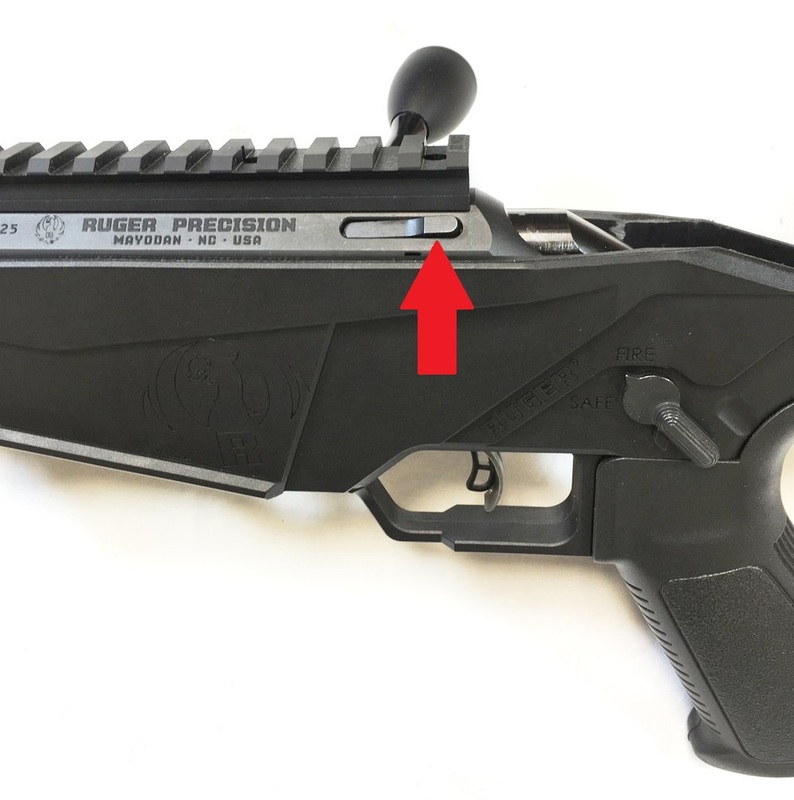 Ruger Precision Installation Instructions — Jard, Inc.
1. Remove magazine and work bolt to ensure the rifle is unloaded. 2. (Rimfire) With flat head screw driver, remove plastic cover located directly behind the bolt. 3. While pressing bolt release button (see image above), work bolt backward to remove. 4A. (Rimfire) With 1/8" Allen wrench, remove bolts on both sides of the magazine well to remove the action from the receiver (pictured above). 4B. (Centerfire) With a 3/16" Allen wrench, remove bolts located behind the folding buttstock (pictured below, left) and on the left side of the receiver (pictured below, right). 5B. To remove the stock trigger assembly from the receiver, push it back, aligning the shelves on the trigger assembly to the cutouts on the receiver and allowing the trigger assembly to drop free. 6. To install the JARD Ruger® Precision Trigger Assembly, first align the shelves on the trigger assembly to the cutouts on the receiver, then slide the trigger assembly forward (the trigger assembly may not slide forward easily). 6B. (Centerfire) When installing JARD Ruger® Precision Trigger Assembly, position washer between the screw hole on the action and the trigger housing (pictured below). Reinstall screw. 7. To set the trigger, start by adjusting the sear engagement. The sear engagement set screw is located in the bottom most hole (C, as pictured above), and requires a 0.050" Allen wrench for adjustment. To set the sear engagement, rotate the set screw clockwise until the trigger fires. Then turn the set screw back, counterclockwise, approximately 1/4 turn. This completes the sear setting process. To ensure the sear engagement is to your liking, test the trigger and adjust as needed. 8. The next step in setting the trigger is adjusting the overtravel. The overtravel set screw is located in the middle hole (B, as pictured above), and also requires a 0.050" Allen wrench for adjustment. To set the overtravel, turn clockwise until the desired amount of overtravel is reached, testing as you adjust. 9. The final step in setting the trigger is adjusting the pull weight. The pull weight set screw is located in the top most hole (A, as pictured above), and requires a 5/64" Allen wrench to adjust. The pull weight adjustment set screw should be flush with the face of the trigger housing. WARNING: over-tightening the pull weight set screw to reduce pull weight past the point of being flush with the trigger housing may result in damaging the pull weight spring, thus compromising the trigger's reliability. *If a lighter pull weight is desired than can be achieved by ensuring the pull weight set screw is flush with the trigger housing, lighter trigger springs are available for purchase. 7. Before remounting the action to the receiver, ensure the safety lever is in the SAFE position. The safety lever must remain in the SAFE position during the remounting process. It may be easiest to keep a thumb on the safety lever to keep it in place. 8. When remounting the action to the receiver, the C shaped recess on the bottom of the trigger assembly must slide onto the angled recess on the safety selector (pictured above, left). To match these up, it is easiest to bring the action in at an angle (pictured above, right). 9. Before reinstalling the action mounting screws, test the safety to ensure the trigger assembly is properly installed. 10. Reinstall the action mounting screws on both sides of the magazine well, reinstall the bolt, and enjoy your new JARD Ruger® Precision Rimfire Trigger! *Note, for JARD Ruger® Precision Rimfire Trigger Assembly installation, there should be a washer left over in package after installation. This washer is for JARD Ruger® Precision Centerfire Trigger Assembly installation only.